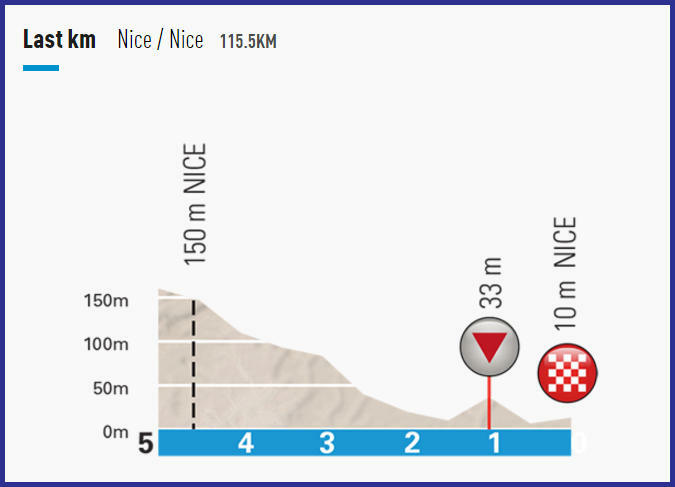 The short final stage of this edition contains the trademark climb of Paris-Nice, the Col d’Eze. Look for updates to the route before the start of today’s stage. Km 21.0: Côte de Levens – Cat. 2, 6.2 km at 5.5% avg. Km 37.0: Côte de Châteauneuf – Cat. 2, 5.4 km at 4.4% avg. Km 51.5: Col de Calaïson – Cat. 2, 6.3 km at 4.4% avg. Km 68.0: Côte de Peille – Cat. 1, 6.5 km at 6.9% avg. Km 100.5: Col d’Èze – Cat. 1, 7.7 km at 5.7% avg.